Please only use the files located here as directed by Easy Dairy Support staff, as they may cause issues with your system if used incorrectly. Periodically run data creation programs for heat detection. Please follow this procedure to stop your touchscreen from flashing different colours when the computer is turned off. The procedure is designed for use with the buttons on the back of the touchscreen. 17″ Touch Screen Drivers. Click on the link and select Save As when prompted and save the zip file onto a memory key. Only use when directed by Easy Dairy Automation Systems support staff. 19″ Touch Screen Drivers. Click on the link and select Save As when prompted and save the zip file onto a memory key. Only use when directed by Easy Dairy Automation Systems support staff. This fixes list index out of bounds errors. Only use this when instructed by Easy Dairy Automation Support Team. A zip file containing all of the Groups that Easy Dairy comes with as standard. 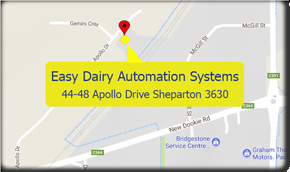 Only use when directed by Easy Dairy Automation Systems support staff.